Mangaluru, April 25, 2017: Talking to media in the city on April 24, Monday, U.T. 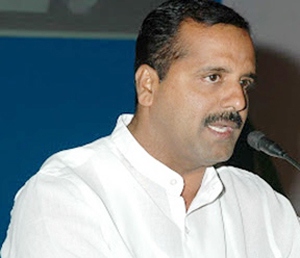 Khader, Minister for Food and Civil Supplies, said that the process of verification of 10 lakh applications filed online by below poverty line (BPL) family members for issuance of ration cards will begin from May 3. He said confusion among the Revenue Department personnel about norms to be considered for scrutinising applications led to the delay. He said that the verification process was now made simple by allowing a voluntary declaration by the applicant that his or her annual income was Rs. 1.2 lakh and below. Minister Khader said required changes had been made in the software and the verification process would begin from May 3. The applications with the Food Department will be sent to village accountants who will verify and ratify the claims. The ration card would then go for printing and be delivered through speed post to the applicant. Anila Bhagya : Minister. Khader said from May 1, the department would conduct a survey of BPL people who have been left out of Pradhan Mantri Ujjwala Scheme to provide cooking gas. The Centre has identified 2.16 lakh families under the Ujjwala Scheme, which is yet to be implemented in Karnataka. Following the survey, the State government will provide those families with cooking gas connection for free under the Anila Bhagya Scheme. Under this scheme, the State will bear the complete cost of Rs. 1,920 per cooking gas connection, he said.